Elizabeth Overmann, a litigation attorney at the Law Offices of James Scott Farrin, spoke to the 35-member class on March 29 for over an hour. Overmann provided an interactive question-and-answer style presentation focused on what it takes to become an attorney, as well as issues involved in actual cases she has worked on. When C.E. Jordan High School teacher Michael Irving realized how many students in his Freshman Focus course were interested in becoming attorneys, he reached out to the Law Offices of James Scott Farrin to provide a speaker for the class. Litigation Attorney Elizabeth Overmann answered the call. Overmann said one of her goals was to make students aware that decisions they make now can have an impact on their future. Elizabeth Overmann graduated from the Norman Adrian Wiggins School of Law at Campbell University in 2003. 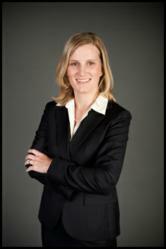 She has since focused her career on civil litigation and personal injury law. Her passion for personal injury law comes from personal experience, having survived a serious car-truck accident when she was 15. She is licensed to practice in both North and South Carolina and is a member of the Durham County, North Carolina and South Carolina bar associations, the North Carolina Advocates for Justice and the American Association for Justice. The Law Offices of James Scott Farrin has worked with Durham Public Schools in the past. Last year, it donated more than 300 educational items to the district. The Law Offices of James Scott Farrin is headquartered in the American Tobacco Historic District, adjacent to the Durham Bulls Athletic Park, in Durham, North Carolina, with 12 additional offices statewide in Charlotte, Fayetteville, Greensboro, Greenville, Goldsboro, Henderson, New Bern, Raleigh, Roanoke Rapids, Rocky Mount, Sanford and Wilson. The firm’s 26 attorneys focus on the following practice areas: Personal Injury, Workers’ Compensation, Social Security Disability, Intellectual Property, Civil Rights, Mass Torts and Products Liability. Four of the attorneys are North Carolina Board Certified Specialists in Workers’ Compensation Law and one is a North Carolina Board Certified Specialist in Social Security Disability Law. The Law Offices of James Scott Farrin is involved in the community, including sponsorship of local philanthropic organizations and an active employee matching donation program.